Easy to push button controls. Automatic depth of bend selector. Control positionable on both sides of bender. Complete manual control for free design work. Custom-made tooling available to fit your needs. Bends up to 3” round and 2-1/2” square tubing as well as various diameters of schedule 40 pipe and solid bar stock. Compact 40” x 40” foot print. Powerful 7-1/2 HP power unit. 58,000 lbs. of bending force. 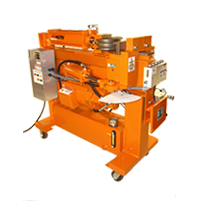 The Huth Vertical Bender Model 3006 offers the same automatic control as the horizontal models 2008 / 2806, for quick precise bending. The control may be positioned on either side of the bender. 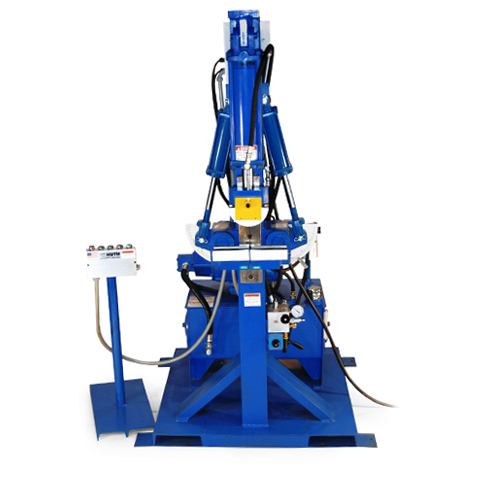 The automatic mode features an adjustable depth of bend selector for precise bending and repeatability. It also offers an adjustable return to home position setting. This setting allows for a minimum return stroke, which will increase cycles per hour on smaller diameter materials. The manual controls make design work and setup easy. The Model 3006 comes standard with a 7-1/2 horsepower motor. The bender has 58,000 lbs. of bending force. 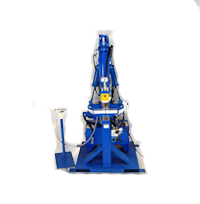 Vertical benders make fixturing easier because you are positioning the tube or pipe in the machine with gravity working with you. 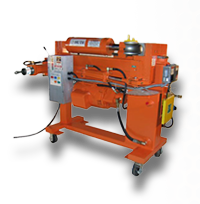 They also have a smaller footprint and swing area than a horizontal bender.